As the cows come through the gate into the neighbor’s pasture outside my studio window, I can barely see their dark bulk against the gray sky. Slowly, heads hung low, they move out into the field. I watch through the rain-pocked window, thankful to be in here and not out there. And then I think that, often, the presence of God is much like what I’ve just observed through my window. My world is dark and gray, it’s raining in my heart, and God comes in… slow and steady. Massive and silent. Impervious to whatever storm is going on my life, the Lord moves into the field of my pain or heartache or sickness and settles there. Quietly. No fanfare. Its just that, sometimes, I haven’t noticed that He’s there, because I’m too focused on the rain. Or the pain. Or both. I woke up this morning with Francesca Battistelli singing this bit of lyric in my head from her song, Holy Spirit. And I know that this is what I want… To be more aware of God’s presence. To feel his warmth and BIGness in the middle of my pain. And maybe sit down beside Him, so that He shelters me from the wind and rain of doubt or fear. Click here to listen to Holy Spirit from Francesca Battistelli. Click here to read an earlier post about this song… Appetizers. Keep your barn doors open! 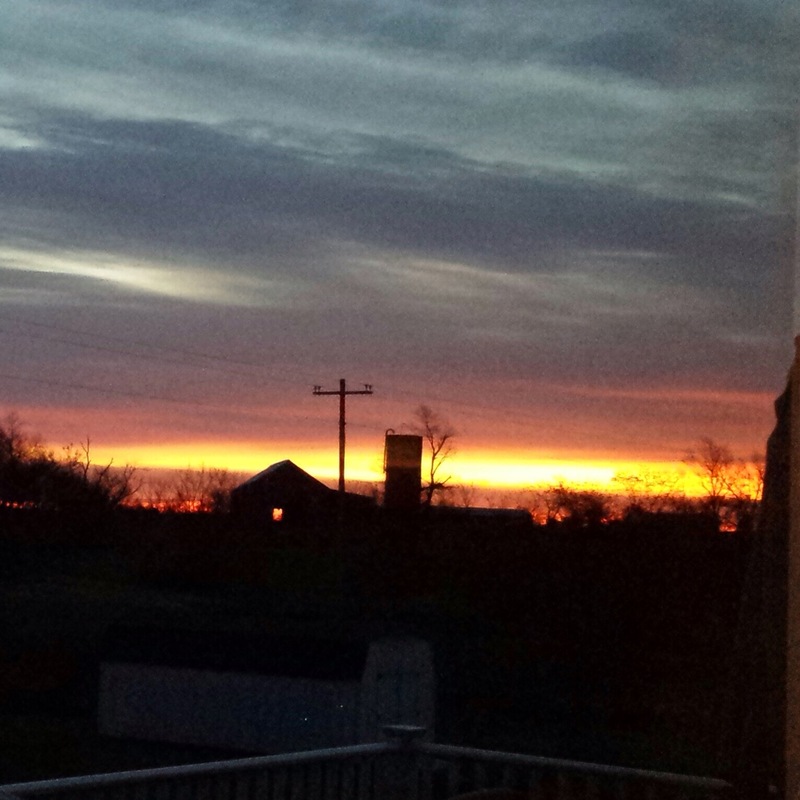 Another beautiful sunrise through these barn doors this morning! God is such an awesome Artist!!!!! The sunrise was beautiful this morning. When I woke up, the color was just creeping into the sky. When I looked out the kitchen window, I saw the sunlight starting to wake up the world behind the barn on our neighbors farm. The coolest thing is that the barn doors are open so the light from behind was shining through. The picture is grainy, but maybe you can see it. It got me thinking… The light of God is like that sunlight shining in our lives. It warms and fills everything it touches! Our job, as Christians, is to have our barn doors open so the light can shine through us. We can’t save it all for ourselves and keep it locked inside. We must throw open the doors and windows of our hearts so that God’s love can shine through us and touch others.